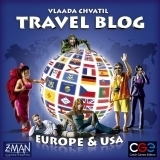 Travel Blog was created by Vlaada Chvátil and is published by Z-Man Games. The object of the game is to get to your destination the shortest way and by spending as little money as possible. Players have their choice of either playing with the states or with the countries of Europe. Seven state/country cards are revealed then there is an eighth and ninth card, which is the starting place and destination. Players take their tokens and place them on a state/country card that can be reached by crossing the fewest number of borders to the destination. There are penalties if you don’t place your token first on a state and if you happen to choose a state bordering the starting state. I didn’t like the game. It could be partially my fault, because I was expecting a map game like Ticket to Ride. Maybe it was the way I was playing it, but it felt as if the game was created in like a few days. The game’s presentation is very nice. The artwork is colorful. Unfortunately the game board is too small. Travel Blog is recommended for between 2-6 players. I can see 2-4, but 6 on the game board is cutting it close. There isn’t much to say about this game, because there isn’t much substance to it. Rating wise I would’ve given it a 3 out of 5 stars, dice…whatever. naturally like your web-site but you need to test the spelling on several of your posts. Several of them are rife with spelling issues and I in finding it very troublesome to tell the truth then again I’ll certainly come back again.